For every business owners, the secret behind the success of their business is to keep the list of their loyal consumers intact. Sales staffs are endowed with the tasks of gratifying the consumers so as to attract and retain them. For this, they need to provide their sales staff with all of the training tools to keep consumers happy and satisfied. Providing training to the sales staff plays a significant role in every business operation. However, the best way to train the staff is to hire a sales training company to help the sales staff gain more proficiency and expertise in their respective field. 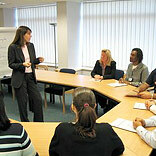 It is imperative that the sales staff get the training that will help them to achieve the sales targets of the company. One of the best ways to get the best training for the staff is to hire an outside company to do the training. However, a quick study of the available training providing companies will help you to zero down on best. Though, it is essential to make sure that that the company that is hired provides online sales training as part of their training programme. The training programme should teach all the methods to achieve sales through advertising, marketing, and online sales techniques. Though there are a number of ways in which the sales training company can conduct their training programmes, however it can be determined depending upon the quantum of the staff. Online training is best suitable for employees who travel frequently. On the other hand, for the staff who are in the office for much of the time an in-house training session can be organised. The business owners can opt for both the training modes to suit different members of the staff. Stressing upon benefits of advertising: The most important tool to achieve sales target is advertising. Make sure that the outside training company that is hired for the staff training, teach the benefits and techniques of advertising. On the completion of training, the staff should understand how to effectively use advertising as a tool to enhance sales, promote growth, and attract new consumers. Marketing strategies: Marketing strategies should focus on the energies and resources of the company to increase sales. The hired training company should highlight the components of marketing strategy which includes promotion, product development, relationship management, distribution, and pricing. In addition, the training company should identify the firm's marketing goals, and should explain how these goals can be achieved. Marketing strategy training should also teach about choosing the target market, positioning, and marketing mix. Promote online sales: Online technology (Internet) has created a new way of conducting sales and it is important that the staff should be trained to conduct online sales. The training company can be asked to provide online sale training to promote online sales. Today, online sales is the best and the most popular medium to achieve sales target as it is a medium of the masses and connect to the world on just a click of the mouse. However, majority of the business owners have now realised the significance of providing adequate training to their staff but very few support outsourcing training of the staff. They feel that it is a costly affair. Nevertheless, once you will outsource the staff training to a professional company and start getting benefited, you will acknowledge that the cost of hiring a training company is worth paying.